Donald Trump's snubbing of Angela Merkel's handshake today was one of the most socially and emotionally uncomfortable moments in recent political memory. 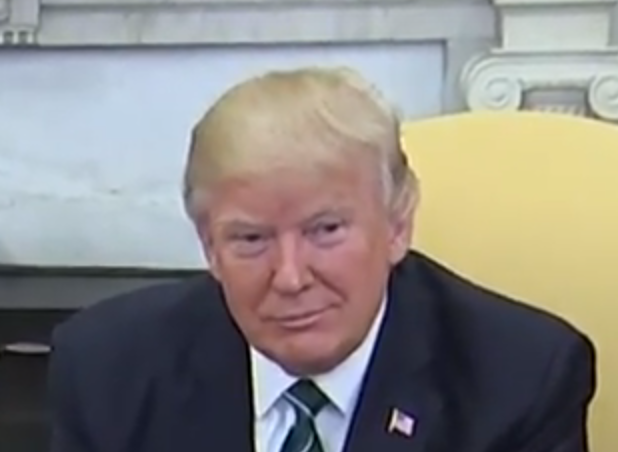 There has been speculation and reports that Trump did not hear Chancellor Merkel, nor the journalists asking - yet this is nearly impossible to believe at face-value and moreover Trump's body language clearly contradicts such a claim. From a nonverbal perspective, this interaction is very much worthy of thin-slicing. The image above (during 0:24) shows Angela Merkel blushing. Those who blush easily, have, for the most part, a higher "Sincerity Quotient". The German leader is embarrassed. Later, towards the end of the above video, there's a profoundly phenomenal example of Nonverbal "Leakage" and "Leakage Transfer". 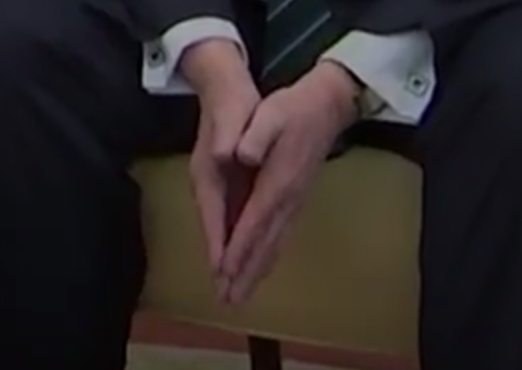 In the nonverbal world, the term "Leakage" is a metaphor used to describe the phenomenon whereby body language and facial signals "trickle out" despite the desire and attempt to suppress them. At 0:54, some of the journalists begin asking for a handshake (this is also included, but somewhat edited/truncated, at the beginning of the video). A few seconds later, Donald Trump begins shaking his head side-to-side in a classic but somewhat blunted "No" gesture ("Illustrator"). It was not his intention to openly express his true feelings by this head shake - and when he then realizes (perhaps just at the edge of consciousness) his internal thoughts are then being outwardly and involuntarily expressed - he immediately stops shaking it. (A classic steeple [whether low, mid-level, or high] is configured with the palms a good bit further apart as well as with the fingertips approaching each other end-to-end [like a spider's legs reflected while walking on a mirror]. 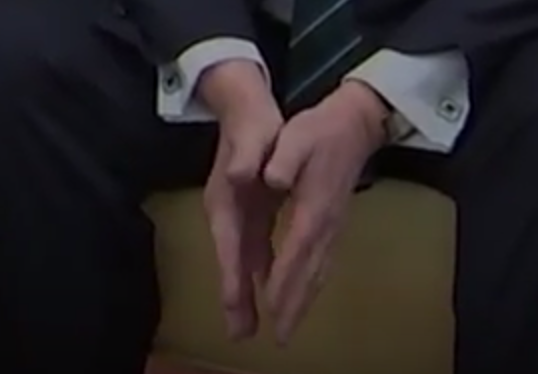 In contrast, here, the long axes of Trump's fingers are much closer to being parallel). 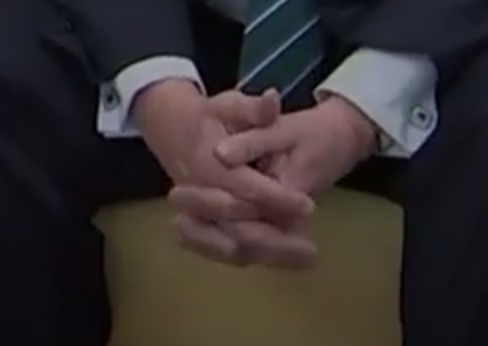 And then to a pseudo-clap with the base of his hands touching/nearly touching while his fingers move-together, move-apart, move-together, move-apart, etc. - indicating a further elevation in his anxiety. 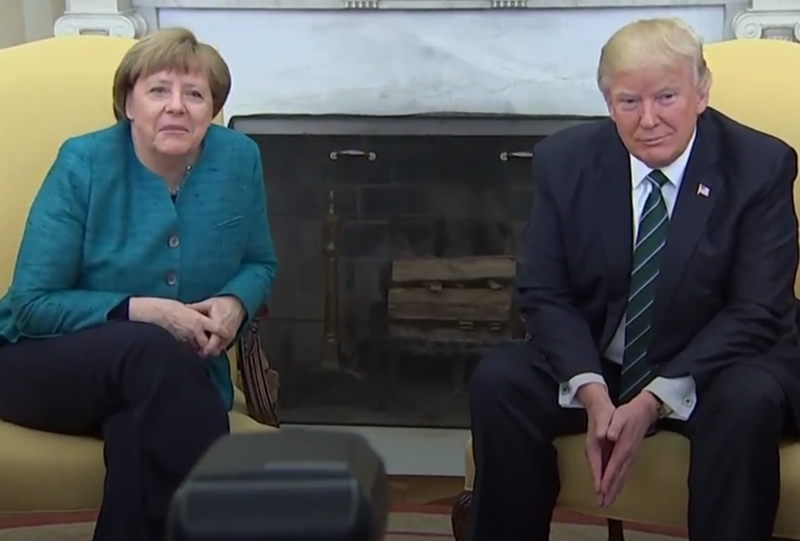 During 1:04, Trump distances himself from Merkel by momentarily leaning away from her - while Merkel's expression screams, "Bewildered" (above). 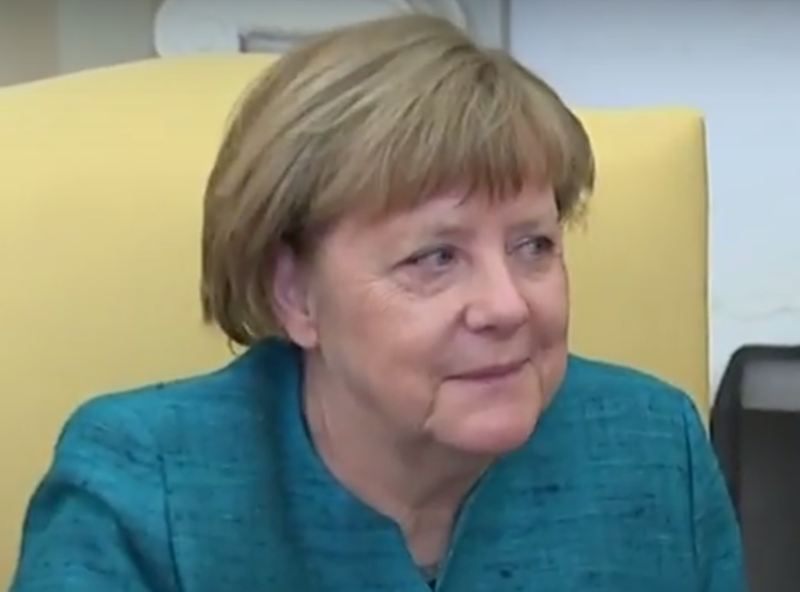 Then Angela Merkel's expression (1:06 - 1:07) transforms into an amalgam of Disbelief, Disgust, and Embarrassment. 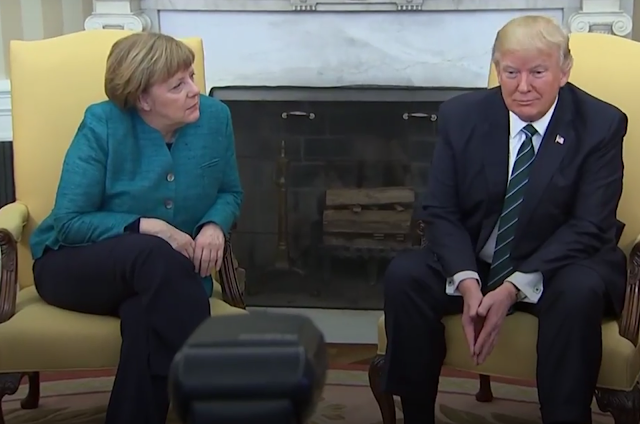 Notice also how Merkel is both leaning toward and partially turning (rotating) to Trump - yet he is "Whole Body Pointing" 90 degrees from her - giving her proverbial "The Cold Shoulder". One way to show respect is to turn your body (eyes, face, torso, hips, feet) toward a person. When we turn away from another - it's showing that we don't care, don't respect, don't like and/or don't believe them. Colloquially, Chancellor Merkel's face is very much saying, "Okay - I'll just stay over here and watch while you have your tantrum". Simultaneously (and throughout the majority of this video segment), Donald Trump's emotional tone is that of Contempt. 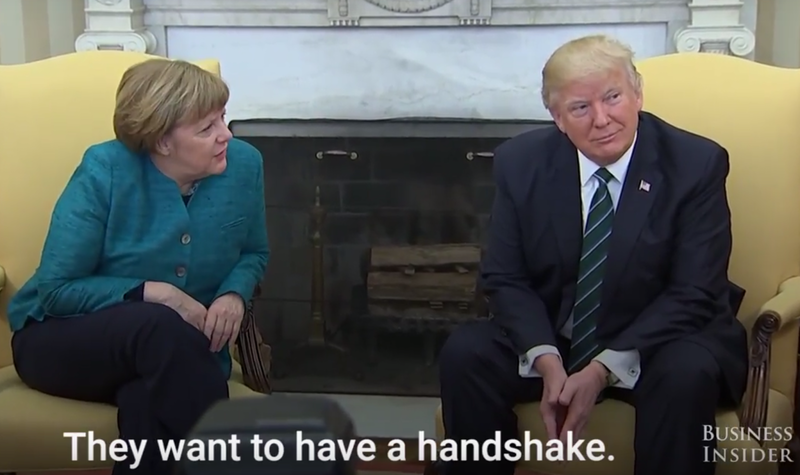 Conclusion: Donald Trump heard the request for a handshake from both the journalists and Chancellor Merkel and deliberately ignored it. Throughout most of this segment, President Trump displayed contempt, disrespect, and significant anxiety. 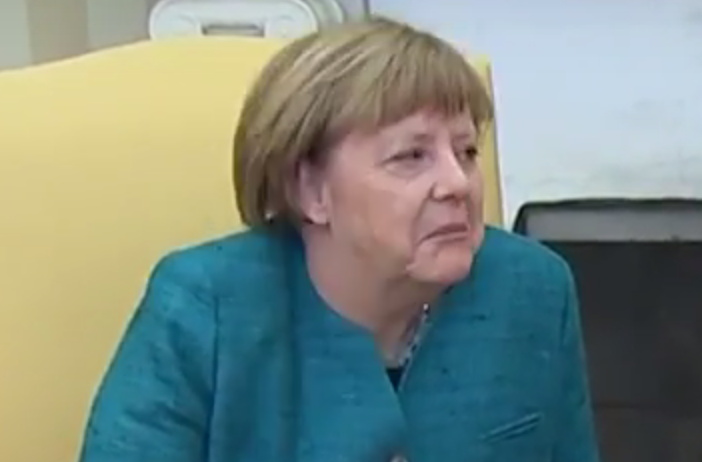 Angela Merkel was shocked, embarrassed, and bewildered.